Beetle Bug — Alone against the monsters. The little bug Beetle wanted to spend a quiet evening watching TV. Yet, suddenly peculiar monsters began emerging. What do these guys want down in the underworld? But don't forget to pick up one or more pieces of treasure on your way. That will bring important bonus points. And beware: just throw a stone on the monsters, that should help stop them. Download free full version game now and help the little bug to preserve the underworld from the evil monsters! 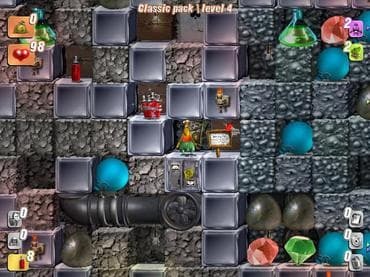 Free Game Features: - Tons of wacky characters; - More than 100 Levels of challenging fun; - Tons of bonuses; - Brainteasing puzzles; - Download free full version game now and try to solve the buggy mystery. If you have questions about Beetle Bug game, please contact us using this form.